After an overindulging weekend I wanted something very light for today's lunch. 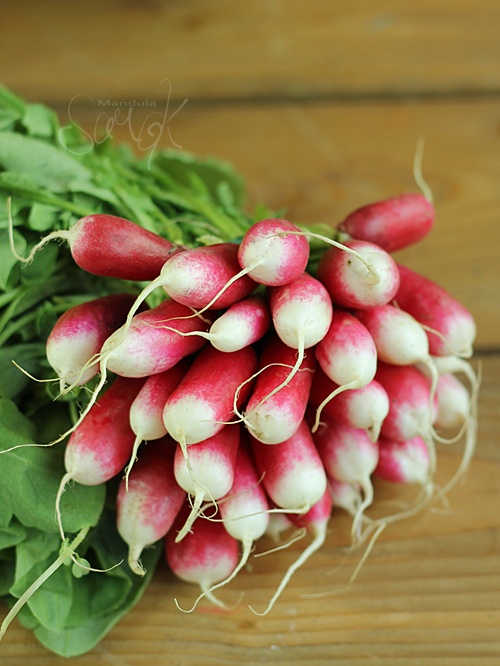 As I anyway bought too many bunches of radish on the market, I wanted to make something that needs a lot of them. I have had the idea of radish soup already for a while on my mind, but I always postponed it. I definitely wanted to cook the radish, but it was important to keep its colour, therefore I prepared a stock using potatoes and then I used that to cook the radish for a few minutes. During the morning walk I collected some ramson flowers, ground ivy, yellow archangel, henbit deadnettle that brought spring right onto the plate. Peel and cut potatoes in cubes. Sautee chopped onion in a teaspoon butter, add diced potatoes, bay leaf, caraway seeds and vegetable stock. Cook over low heat for 15-20 minutes. Now sieve and set the liquid aside. You won't need the cooked potatoes for the soup, but do not throw away, instead make a puree or use in some kind of yeast dough that needs cooked potatoes. Sautee sliced radish in the other teaspoon of butter, add the potato liquid and cook for 2-3 minutes. Pour the soup into a mixer, add yoghurt and puree, season with salt and pepper. If you want a really smooth soup sieve. Serve the soup either lukewarm or chilled. For the oil puree about 1/4 of the radish leaves with the rapeseed oil. are you serious..that looks incredible..how did it taste? This is so beautiful, and i love eating flowers!! Absolutely beautiful!! The most exquisite colored soup I've ever seen. Love! Hello! 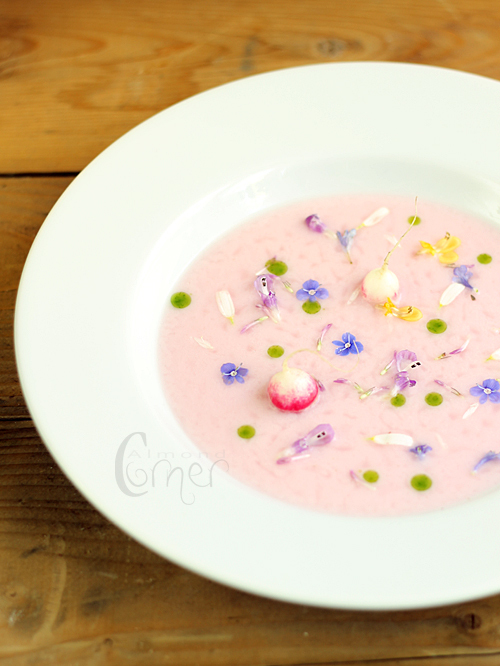 I don't like radish but the soup looks so pretty that I feel I should try and make this recipe.